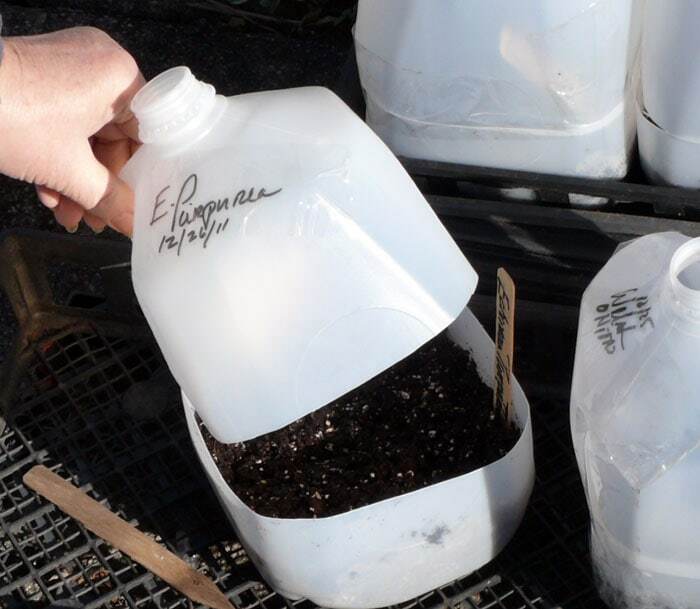 Last year about this time, a reader of TMG sent me a link showing pictures of someone using gallon plastic jugs like mini greenhouses. They cut the jugs almost in half leaving the top part slightly attached. Punched holes in the bottom for drainage. Filled the bottom with about 3 inches of Pro-Mix and watered well. Jug has been cut, holes punched in bottom, filled with potting mix, watered, and labeled. Planted the seed and labeled the jug for identification. Tapped the top half of the jug in place, left cap off for ventilation, and placed them all outside to weather the cold, rain and snow. And forgot them until almost spring. Lo and behold when the time is right the seeds germinate. This method suited me to a tee and I couldn’t have been more pleased. I don’t have space inside to start seed, nor do I have proper light. Also, I don’t want to be bothered with watering all the time, and it’s enough to tend peppers and tomatoes when the time comes without having to “take care of” lots of other things. My seed germinated before the end of cold weather but it didn’t hurt those seedlings one bit. After severe cold was past I removed the tops. The seedlings are already hardened off since they came up on their own outside. They held nicely until I had time to plant them. The only thing I had to do at that point was make sure they didn’t dry out. Some months later I found that Trudi Davidoff, a Long Island housewife had made “wintersown” very popular. This method can be adapted to fit your needs and you can use all kinds of recycled containers. Her website, wintersown.org, covers almost every senario. 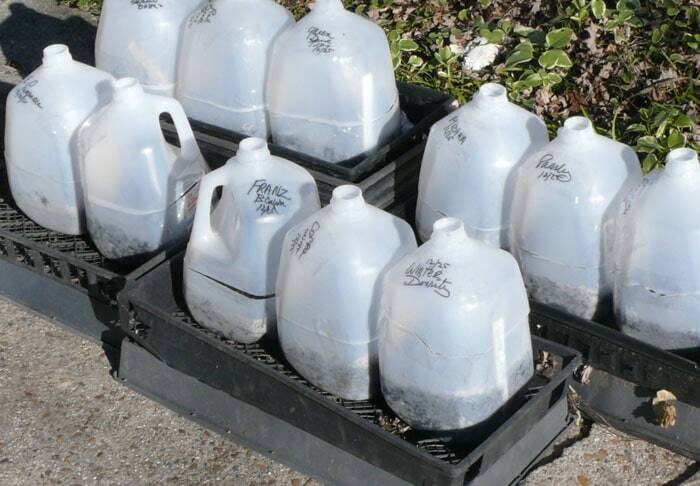 I prepared and planted gallon jugs on the Winter Soltice, Dec. 21st. Planted are parsley, onions, bunching onions, lettuces, rosemary, ecinacea purpurea and nasturtiums. Snapdragons, thyme, lavender, anchusa, basil, verbascum, and a few others are waiting to be planted. This is such an easy way to start plants that I hope you’ll give it a try. It gives you a jump on the season and makes it easy to start a lot more plants for your garden and borders. I’m loving this idea and plan to give it a try! Getting just a few weeks’s jump on spring can make such a big difference in the harvest! I’ve done this for the past four years since finding the wintersown website. It’s great! When I tried to start seeds indoors under lights, they inevitably damped off, despite my using sterile planting mix and running a fan in the room. I’ve had total success with the wintersown method (unless I don’t get the seedlings in the ground in time, but that’s my fault)! I encourage everyone to try it! You also can use containers from baked goods and rotisserie chickens. Follow the directions on the wintersown site for creating drainage and vent holes. You’re absolutely right Gayle. Just a few weeks’ jump on spring CAN make a BIG difference. And to top that off, it looks as if we are going to have a mild winter and early spring. Hope it will be a great growing season! Your input will be encouraging to many! If I’m reading “between the lines” correctly, sounds as if you’re winter sowing in the garden as well. I’m doing that too. I was inspired by a comment Gayle made early in the year — so I was ready to go after the Winter Soltice. Won’t be long before things will be germinating and that’s exciting! So, you started these on Dec. 21’st? When do you expect seedlings and when will you expect to transplant? This seems like an excellent idea to start early veggies since I don’t have a greenhouse, cold frame, hoop house, or outside shelf. I do have several 32oz Stonyfield yogurt pots with the lids. I wonder if this would work the same if I can find a way to tie them down. What a great idea!!! Yes, Farming Bear, I planted the first jugs on Dec. 21st and am still in the process of planting. Have about 17 jugs so far. Seedlings will come whenever they’re ready to come. Will depend on lots of variables — especially temperatures. As I said in the post — I transplant when its time to plant (that particular plant) or when I get to it. Will work great for cool weather (early) veggies. I think the yogurt pots would work well as long as they are not so opaque as to block light. Getting as much light as possible is important. Clear tops are best or either the jug tops as shown in the post. Remember to punch holes in the container for drainage AND punch holes in the tops for venting. With the jugs I just remove the tops for venting. Ok Theresa, did my wintersowing today. Never tried this before but I am so ready to garden that I figured this was at least some kind of gardening. I did some onions, zinnias,forget me nots and some herbs. Keeping my fingers crossed. Way to go Danita! I think your onions, forget-me-nots and the herbs are going to do GREAT! It might be a little early for the zinnias depending on what the weather does. For example, you would not winter sow tomatoes right now because they are a warm weather crop and you would not be able to set them out until the weather and soil warm in the garden. Zinnias are like tomatoes — warm weather crops. Nonetheless, it will be a great experiment! Keep me posted! I’ll be thinking of you as I watch my jugs planted with onions and herbs. Thanks Theresa. My tomatoes get started in the house under the lights around mid March. I found the half packet of zinnia seeds with the other seeds and thought what the heck. Whats the worst that can happen. I will keep you posted. Thanks for the encouragement! I’ll be looking forward to hearing about the zinnias. And Happy New Year to you too Danita! I used the wintersown method a few years ago, before hubby built me a “greenhouse.” I used a whole collection of plastic containers–jugs, soda bottles, yogurt tubs, fruit baskets, ice cream tubs, etc. The ones I liked best had their own hinged tops (fruit baskets). I had to mess with plastic to make covers for others (yogurt tubs). They all worked fine, and I have re-used the containers several times. (This year I threw away the soda bottle pots because I finally got tired of the jagged edges and now have lots of better substitutes. And some things just disintegrated from the freezing cold up here and were disgarded after one season. I’ve never managed to figure that one out–after all, aren’t ice cream tubs USED to being in the freezer? I arranged all these make-shift pots as best I could on my patio stones close to the wall, some sitting on bricks and others bunched up in bicycle baskets, etc. Around April it was so exciting to see growth in them. For example, the broccoli begged to be planted when my fingers were still freezing when I worked outside and I still didn’t have a place to transplant them. One day a big wind blew over the baskets and I was forced to transplant plants wherever I could find spots! This year I laid out all my make-shift pots on “tables” made of pallets in my “greenhouse” and planted them in March or April, whenever it was that our early spring arrived, and my gardening season got an early start. I haven’t had a break since! Both methods worked, but I’m actually thinking I’ll wintersow my stuff again this year–the only differences being shelter for the plants and a break between the planting season and the transplanting season for me. And since my “greenhouse” is really a shelter over 7 in-ground raised beds and my worktables, I’m planning to plant my warm-weather crops directly in the ground instead of in pots as I did this year–that backfired on me. The seeds just did not seem to take in the pots. It is indeed interesting Connie. Thanks for taking time to share. Can you plant tomatoes, radish, and cucumbers using this method? Yes you can Alyona — BUT tomatoes and cukes are warm weather crops — SO you have to adjust your timing. No sense in planting them in cold, cold weather. Search the site for all the winter sown stuff I’ve written. I give a lot of detail about how I start tomatoes and peppers that way. Also search the seed starting stuff. Then let me know if you have more questions. Thank you, I will do the search. I just saw this posting and of course I have a question. I am going to give this a try to see how things will germinate and grow for me in the jugs, but I think that I need to start with spring planting seeds since I am in Florida, as I will be running out of cold weather soon. I also would like to have a grow light in the house, but they are so expensive, so I am going to make my own. The question that I have is, do I need to use a heat mat with the grow light or is the light alone sufficient to help them germinate and grow until I can get them moved outdoors to get acclimated before planting in the ground? I also read that if I was only starting seedlings and not using the lamp for like violets etc, that I did not need to use the T5 bulb, but would be fine with a warm light and a cool light to germinate. If I do not speak to you before next year, I want to wish you a very Happy New Year!! Light is not what causes your seed to germinate. Grow lights are not for warmth, but light. When I germinate warm weather crops inside —- I don’t use any heat source at all. (It’s just warmer inside than outside right now.) If you want to — you can put them on top of your refrigerator for additional warmth as many people do. I don’t have room for grow lights — which is why I move things outdoors in the jugs. You don’t need ANY expensive equipment to start seed. If you WANT light — you can just buy regular florescent lights and keep them 2 inches from the seedlings after they germinate. To get a better understanding of how I start various seeds (which is the easy way) read ALL of my posts on wintersown. I’ve been winter sowing for years, Theresa, using two large glass reptile tanks with screens, found in an alley near where I live. It’s amazing what people throw away! I keep them on a stand in my garden filled with containers of seeds waiting for nature to take it’s course. Perfect for winter sowing! What a great way to do winter sown, Sharon! Those reptile tanks were a great find. Sharon has a great idea, and I have a large tank that I have been wanting to get rid of, and now I can use it. Do I need to sterilize the tank and if so how? and do I plant right in the tank, or would I use containers and let them sit inside. No glass top required? If I was to plant directly in the tank, how would I remove the plants without disturbing the roots? Thanks again for sharing all your great ideas. I’m going to send Sharon an email in the hopes she’ll hop back on and answer these questions for you about what she does. In meantime — here’s my input. I am understanding Sharon to say that she put the containers with the seed inside the tanks. The containers will have tops on them — but some opening to allow for ventilation. With my jugs — I take the cap off the top of the jug. That’s my vent. With wintersown — you can’t leave the entire surface of the soil exposed to the elements. If we could do that — we could plant directly into the garden in winter — —- thus the purpose for an enclosed container. But you have to have some opening for air ventilation. It’s always a good idea to sterilize things you use — most especially things like these tanks that you don’t know what bacteria they are carrying. I think you could use a 10% bleach solution or even white vinegar and water solution. If I am correct about Sharon putting the containers into the tank — then you probably won’t need a top for the tank because the containers are already enclosed. And by the way — when you transplant the seedlings from a winter sown container — you more than likely will disturb the roots. Just be a little gentle. Then disturbing them should not be a problem. Theresa is right on regarding the reptile tank. I just washed mine out real good with soapy water and gave them the 10% clorox wash. I use any kind of recycled plastic containers with their tops. Don’t forget to put some slits in the bottom for drainage. Salad containers, etc. are great as are used six packs or pots from the nursery. Any kind of container you could fill with potting mix. Of course, I wash those out very thoroughly and sterilize. Just sow your seeds and put the containers in your tank loosly covered with their tops to allow for ventilation. You can use plastic baggies also leaving them open a bit. My tanks have screen tops which keep the odd bug out and let’s the air in. If yours doesn’t it’s okay. You don’t need any top on the tank as the containers are covered. If rain is expected, I just turn the tanks on their sides so they don’t get full of water. Actually, there’s more space that way. They work so well, I rarely use my grow lites at home any longer. And what a great way to recycle! Thank you Sharon and Theresa. WOW, such wonderful information you have on your site! I found your site about a year ago, then the link accidentily got erased when my internet had to be re-installed…. needless to say, I wouldn’t quit looking for it again, I finally succeeded… thank God!! Quick question tho… I had a small garden last year with my mom with little success and was looking into doing the milk jug greenhouses (I have saved a lot of them!) but what month would be a good month to start?? I live in the most upper northeast corner of NY (by VT and Canada), any info would be greatly appreciated! Thank you! Glad to have you reading again Kristen. Be sure to subscribe via email — so you’ll get notice of every post in your inbox. I’d be interested in knowing why your garden was not a success. Why don’t you email me at Theresa@tendingmygarden.com and give me some detail on what you do and what your garden is like. I’d like to see you be successful this year. There’s no reason you shouldn’t be. Again — welcome back Kristen! P.S. Being so far North you shouldn’t have hardly any insect pest to deal with if your soil is good and your plants health. That’s a real plus!